Did you know you can now order your Deliveroo takeaway from Potli here on View? 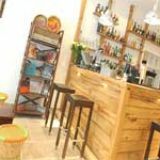 Polti is a relaxed restaurant offering fresh, wholesome and authentic Indian dishes inspired from the marketplaces across India. 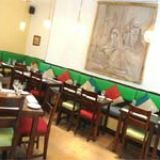 The interior features bright colours, large Bollywood posters and banquette seating. 24 covers on the pavement. What did you think of Potli? I had my third meal at Potli this week & must say the quality is consistently good. I particularly like the Chicken 65 & the Mutton curry on the bone (can't find that in many places). The service was attentive & the cocktails were out of the world! I am just eager to go to Potli again as this is probably the best Indian I had in London for the last 10 years. You can eat around the world within a few hundred yards of Ravenscourt Park, Hammersmith; it’s an area overflowing with foodie riches. The latest top tip: Potli, an unassuming-looking restaurant from the outside, inside it cooks up fresh, vibrant, Indian food, inspired by street markets and that universally loved inspiration – mum’s cooking. Starter for ten: which BBC sitcom did this address feature in back in the 1970s? Answer: Only Fools and Horses. If you remember the episode with the guy who scams Del and Rodders by pretending to have a heart attack as he’s doing a deal over dinner, you’ll have seen this building on the box. Recently refurbished by its new owners, there’s a modest amount of seating outside, and inside they’ve created a space that’s got more to offer groups than couples – two big circular booths sit at one end with green and red tipped cushions and plenty of leg room for five-to-six people. Bright green-cushioned banquettes, clusters of wooden tables and chairs, traditional art on the walls and lamps dangling from the ceiling make up the rest of the room and a trip to the toilets is amusing as they're decked out with kitsch adverts for Him Cola and Brook Bond A1 Tea. People love to eat out round here and Potli’s already got curious locals vacating their usual dinner tables in order to try it out. Faye Maschler’s kind words in the Standard have no doubt peaked interest further. 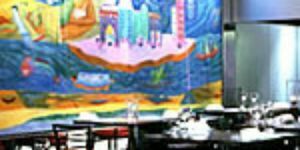 Staff are eager to please, bordering on a little over enthusiastic at times, but overall there’s a real sense of pride and a hands-on approach from the owners. If you live around here and fancy a curry there were previously a couple of ways to satisfy your craving: the serious pedigree of Indian Zing sits a couple of minutes' walk away, and if you head in the opposite direction, you can find the old-fashioned curry house - but still decent - Haweli. Potli is more of the standard of the former than the latter and as well as offering dishes you can’t find at either, it’s cheaper than Indian Zing so is more likely to have you returning on a regular basis rather than reserving it for special occasions. 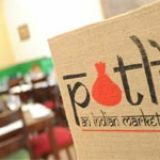 Billing themselves as an ‘Indian market restaurant’, Potli has much in common with the likes of contemporary curry houses like Dishoom in Covent Garden, taking inspiration from all parts of the homeland including the street food found along Chowpatty beach in Mumbai. To get your appetite ratcheted up, nibble on the the bhel puri (savoury puffed rice mixed with diced cucumber, onion, peanut and sharp chutney); follow it with a starter like the fat and juicy king prawns (prawn jhal diye - £8.50) marinated in a sweet, spicy sauce and wrapped in banana leaf; before taking in one of their most excellent mains, like the hot and sour Goan prawn balchao, served with a side of judiciously flavoured lemon rice (£3.50). Oh, and whatever you do, don’t miss the masala lamb chops, of which you get three for £8.50, as these are so lip-smackingly, drool-inducingly amazing that you’ll wish you could just feast on big plates of them for the rest of your days. It’s also worth noting that they serve one-pot chicken or mutton curry on the bone. Sadly a rare sight on Indian menus in England, but a welcome - and authentic – one nonetheless. There’s a decent selection of wine by the bottle, including a Mill Cellars Shiraz from Australia, an intense mix of berries with a touch of spice for around £18 a bottle. Cocktails and Kingfisher beer on draught are popular with others in attendance, and hot and spicy masala chai allows you to end your meal in a fitting way. 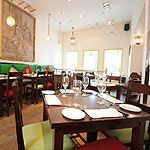 With vibrant flavours, authentic cooking and a menu that’ll make you want to return to work your way through it, Potli is an excellent addition to the swathe of restaurants around Ravenscourt Park. If you live nearby, count yourself very lucky indeed.